If you try to access the Google News Archive Search Home page, you will be redirected to the advanced search page at Google News instead of the old Google News Archive Search home page. Gary Price tipped me off to this and may have a more official post on this at Search Engine Land on this soon. But the news of this going offline came via Google News Help and Google Web Search Help. The Google "News Archives" search function has not been working properly for some time now. It used to function normally but for the couple of months at least , when I type in a search key word or phrase in "Archives" section section of 'Google News', regardless of how many page selections come up and appear at the bottom of the first page , I can only access that one first page of selections. If I try clicking on the second or any subsequent pages, it simply returns to first page of selections that was previously shown. What the heck is the point of showing more than one - and usually numerous - page listings,if nobody can access them??? Please Google,get you act together!!!! 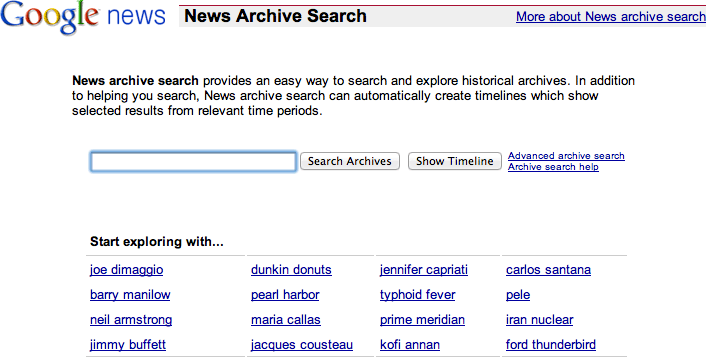 Users can continue to search digitized newspapers at http://news.google.com/archivesearch, but we don’t plan to introduce any further features or functionality to the Google News Archives and we are no longer accepting new microfilm or digital files for processing. I should note, you can see use the feature. For example, here is an news archive search for [jimmy buffett]. You can also use the advanced search page at Google News to get to this information. But the old home page seems to be gone, at least for now. Previous story: Google Webmaster Tools Sitelinks Change Confuses Or Clarifies?